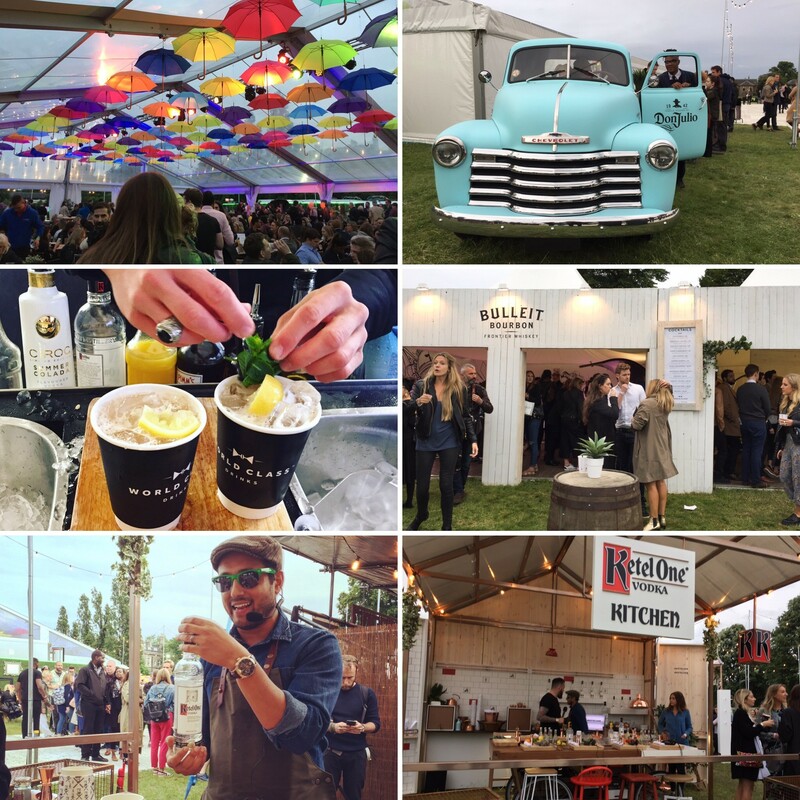 This June, London Evening Standard and Diageo World Class Drinks have paired up to deliver London Food Month – a celebration of gastronomy in Kensington Gardens, featuring pop-up food stands and bars, as well as over 400 events across the capital. Sated meandered on down to the opening of the Night Market to see what was what. Let’s be honest, what we’re essentially talking about here is a festival in a field. However, unlike at most such events, the food and drink are centre stage. Culinary connoisseurs such as The Ivy and Mews of Mayfair sit alongside the people’s heroes, including SMOKESTAK (expect to queue for a good long while), The Cheese Truck and Bad Brownie. On the beverage side of things, this show is very much run by Diageo, who are handling all things spirits, bringing their famous Ketel One Kitchen complete with Cocktail Masterclasses to the party; as well as a Bulliet Bourbon shack with live-art demonstrations from tattoo artists; a Don Julio Tequila caddie bar, and a World Class Bar. For those not quite ready to imbibe the strong stuff, Cobra beer has made its way along too. 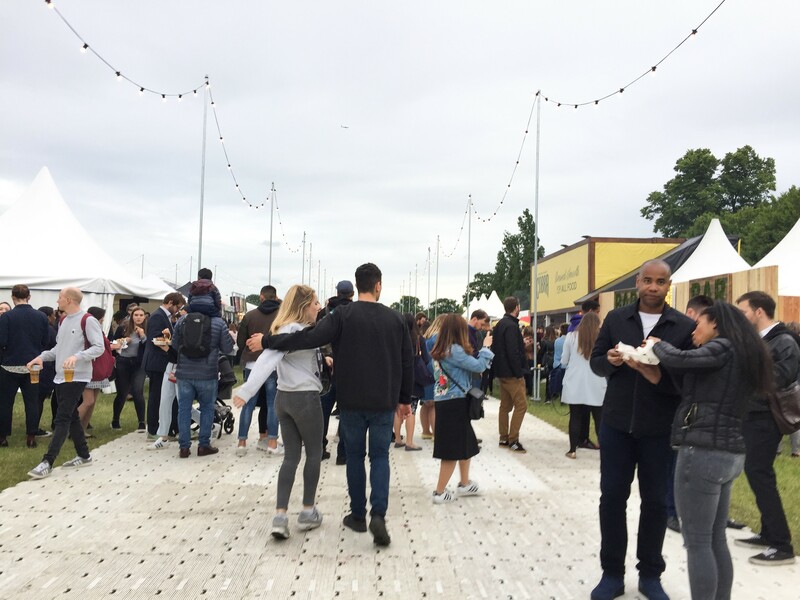 The choice at London Food Month is plentiful and the atmosphere buzzy with DJs, live music and a Westfield Open-Air Cinema completing the entertainment offerings. Open from 5pm till 10:30pm Monday to Thursday, this is the perfect spot to hang out after work with friends, or to take a date. The hours are extended at the weekend too so if the weather is any good, you might as well make a day of it. If not, there is a large covered area with tables and drinks (which somewhat resembles a German Beer Hall) that can be taken advantage of. We heartily recommend a Masterclass at Ketel One with Arj or another of the Ketel One bartenders. Here you will get the chance to learn how to make a Dutch Mule, as well as participating in a multi-sensory experiment exploring how soundscapes alter the perception of taste. All in all, the Night Market at London Food Month is a relaxed foodie haven where you can sit back and wait for Summer to happen. To find out more about London Food Month and ticket pricing, visit the website here. See below for a full list of Diageo Reserve World Class events taking place at London Food Month this June. Fancy a boozy brunch with some of the best Bloody Mary’s in town? Of course you do! Ketel One are hosting four brunches across East and Central London. Ketel One will launch a series of Dutch Brunches at Bethnal Green hotspot, Paradise Garage during London Food Month. The brunches will be comprised of dishes created by the expert chef team from Paradise Garage, Simon Woodrow and Patrick Williams and Michael Zee, whose Dutch husband Mark was the inspiration behind his now globally recognised Instagram feed – Symmetry Breakfast. Guests can enjoy a menu inspired by traditional Dutch ingredients and foods, combined with contemporary ideals of Brunch dishes. Guests will be able to enjoy inside or (British weather permitting!) out on the sunny terrace at the newly launched Ketel One bar. A Brunch with a party twist is taking place at East London’s buzziest hotspot, Paradise Garage. Included in the price attendees can enjoy food aplenty and a welcome drink curated by Ketel One Vodka. Ketel One will be popping up a bar outside that will be serving up signature drinks all summer long. Every weekend throughout London Food Month, guests can enjoy Ketel One Vodka Bloody Marys alongside aqua kyoto’s spin on the perfect brunch. Executive chef Paul Greening offers contemporary Japanese dishes at this exclusive brunch feast. Mayfair’s latest hotspot, MNKY HSE, has transformed their usual Brunch Party with the help of Ketel One Vodka Bloody Marys that have been masterfully paired with an exciting menu curated by executive head chef Pablo Peñálosa Najera. Guests will enjoy a contemporary Latin American meal whilst enjoying the musical delights of numerous international DJ sets and live music performances. Whisky, cocktails, vodka and gin – what more could you ask for? How about being guided on your journey through Diageo’s range by some of the most knowledgeable people in the industry? Be sure not to miss the masterclass at one of our favourite whisky dens, Black Rock (read our review here), or a visit to Ryan “Mr Lyan” Chetiyawardana’s world-renowned Dandelyan. At Black Rock guests will be able to experience an exclusive Talisker whisky masterclass hosted by Brand Ambassador Ali Reynolds. Visitors will be expertly guided through a flight of five Talisker whiskies paired alongside delicious delicacies from Black Rock. The ultimate in luxury drinking experiences in this trendsetting bartender’s hub. Cocktailing pedigree hits new heights at Spanish hotspot aqua nueva. Expect a masterfully created World Class cocktail paired with seafood croquetas. Bar manager Nico Paratinos has created a Spanish-inspired cocktail with Ron Zacapa, manzanilla sherry, Pedro Ximenez sherry, almond syrup, lemon juice, absinthe, a pinch of salt and egg white. When paired with delicious Spanish nibbles makes for sheer, Spanish bliss. Tanqueray No. TEN will be casting their gin magic over one of London’s most sought-after terraces this Summer. Previously not open to the public this exclusive rooftop in Covent Garden will be transformed into a secret gin garden for two days only. One side will serve an English G&T afternoon tea and the other a tropical Cuban celebration, gin-lover’s sign up. Hidden beneath Smithfield Market awaits the acclaimed bar Oriole and its award-winning cocktail and food pairing menu. For one night only, Bulleit will co-host a whiskey and food pairing experience, with a tasting masterclass sampling Bulleit Bourbon, Bulleit Rye and the soon to be released Bulleit 10, all paired with dishes and light bites and set to the live music the bar is famed for. Guests will begin with The Appellation Forest Brew, a sharing serve using Bulleit Bourbon from Oriole’s recently released menu, followed by a tasting session of each Bulleit expression and a final Everglade cocktail using Bulleit Rye. Cocktail aficionados can head to Dandelyan, currently holding the title of third best bar in the world, for a unique and intimate World Class cocktail tasting experience with head bartender Aidan Bowie, crowned GB World Class Bartender in June 2016. Guests can expect a signature Dandelyan cocktail and Aidan will take guests through his journey to create a World Class menu featuring spirits including Ketel One Vodka, Tanqueray No. TEN and Bulleit Bourbon. At Oblix, a destination bar and kitchen offering a refined urban experience and stunning cuisine, guests will taste the best of British produce. Dishes include shellfish from the Scottish isles and Herefordshire Beef, which will be paired with different years and rare barrels of Talisker’s finest whisky. Ketel One Vodka will be putting an interesting twist on drinks at popular East End hotspot Old Bengal Bar. They’ll be serving a controversial cocktail mirroring a famous Italian favourite… Pasta Carbonara. Imagine fried bacon infused Talisker with Ketel One Vodka, homemade parmesan cream (homemade), egg yolk with black pepper and lemon! Expect summer on a plate courtesy of the masters at Ketel One Vodka, who have carefully paired a selection of tasty picnic treats and a pudding cocktail for guests to enjoy throughout London Food Month. Ketel One Vodka have crafted a special London Food Month cocktail named the “Summer Flower”. This botanical treat containing sage and rose jam vodka has been specially paired with delicate floral macaroons. This Father’s Day, join the Island malt from the windswept Isle of Skye, Talisker Whisky, and luxury British menswear designer Oliver Sweeney, as they partner to celebrate their extraordinary heritage in quality and craftsmanship and the limited-edition release of the “Made By the Sea” gift box. Hosted at the designer’s flagship store in Covent Garden, the evening will feature a flight of five Talisker Whiskies and delicious food pairings hosted by David Sinclair, Talisker Whisky Brand Ambassador. At Plateau Ketel One Vodka have created an outstanding Foodie cocktail in homage to Evening Standard’s London Food Month. ‘Allure’ contains a mixture of Ketel One Vodka, goji and chocolate liqueur with orange bitters paired with a gooey, indulgent chocolate brownie. Ideal for Canary Wharf dwellers looking for a bit of indulgence in the City. World Class Cocktails have specially paired a fleet of delectable Johnnie Walker cocktails to complement this decadent new six course tasting menu created exclusively for London Food Month. The evening will be presented by Hawksmoor Group Executive Chef, Richard H. Turner. This special menu is a true celebration of beef and the popularity of it’s suggested accompaniment Johnnie Walker Whisky. There’s no reason why every month can’t be Food Month. Learn from the best at a series of Masterclasses and wow your friends with your new-found knowledge and skills. London Loves Cocktails Head to the M Bar to create Don Julio tequila and Bulleit bourbon based cocktails for guests. Enjoy cocktails with a kick whilst enjoying some tasty light bites at this high-octane London bar. Quaglino’s will host a Martinis and Meringues pop-up with The Meringue girls in the iconic Mezzanine Bar. There will be meringue masterclasses and a paired menu with floral martinis and meringues. Master the art of cocktail making followed by a sumptuous lunch at this French hotspot. Cocktail masterclass and 3 course lunch at Bar & Grill. Learn how to make 3 cocktails followed by lunch. Celebrate summer with a masterclass in refreshing cocktails whilst looking out over unbeatable views across the river Thames. Learn how to make a Fairytale Martini, Kentucky Collins and its signature Burnt Orange Crisp while enjoying British canapés.